Dettah[pronunciation?] 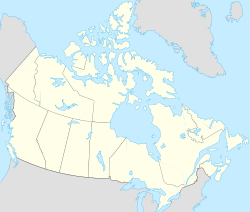 or Detah is a First Nations community in the North Slave Region of the Northwest Territories, Canada. Located just southeast of the capital of Yellowknife, it is a 6.5 km (4.0 mi) drive from that city by ice road across the north arm of Great Slave Lake in winter or a 27 km (17 mi) drive via the Ingraham Trail, year-round. The name means 'Burnt Point' in the Tli Cho language and refers to a traditional fishing camp used by the Dene for hundreds of years. According to the 2016 Census, Dettah had a population of 219 people, an increase of 4.3% from the 2011 Census, consisting almost entirely of First Nations and a few Métis. In 2017, the Government of the Northwest Territories reported that the population was 245 with an average yearly growth rate of -0.2% from 2007. Both it and Ndilǫ are the communities of the Yellowknives. Dettah is represented by the Yellowknives Dene First Nation (Dettah) and are part of the Akaitcho Territory Government. 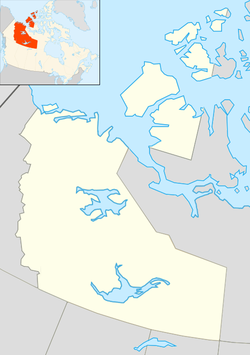 ^ "NWT Communities - Dettah". Government of the Northwest Territories: Department of Municipal and Community Affairs. Retrieved 2017-10-29. ^ "Northwest Territories Official Community Names and Pronunciation Guide". Prince of Wales Northern Heritage Centre. Yellowknife: Education, Culture and Employment, Government of the Northwest Territories. Archived from the original on 2016-01-13. Retrieved 2016-01-13. Northwest Territories, and BHP Billiton Diamonds Inc. Communities and Diamonds Socio-Economic Impacts in the Communities of Behchoko, Gameti, Whati, Wekweeti, Detah, Ndilo, Lutsel K'e, and Yellowknife: 2005 Annual Report of the Government of the Northwest Territories Under the BHP Billiton, Diavik and De Beers Socio-Economic Agreements. [Yellowknife]: Govt. of the Northwest Territories, 2006. This page was last edited on 10 April 2019, at 19:53 (UTC).